Females: 2.2m(7 feet) - Smallest subspeecies! Diet: Many species of deer and wild pig. Habitat: Found only on the Indonesian island of Sumatra. 400-500 wild tigers live on the island's 5 national parks and 235 Sumatrans live in zoos around the World. Sumatran Tigers are big cats with narrow stripes on the orange to dark reddish coat. 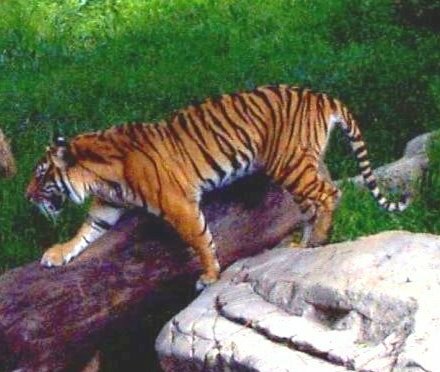 The Sumatran Tiger is darker than other subspecies and is the smallest of Panthera tigris. It has a few adaptations that help it live in deep jungles. Thus, the species has long whiskers that improve the senses of the animal. The fur on the sides of the face is a bit longer. Although the function of the fur is not exactly known, it may serve as a protection means when going through dense bushes. The Sumatran Tiger has white spots on the back of the ears that are believed to visually enlarge the size of the animal and serve as false eyes in the case that the predator is behind. This helps the Sumatran Tiger cubs to be kept safe. Sumatran Tigers are one of the two cats that can be observed in water. Sometimes, they are seen near waterfalls and other water resources trying to cool themselves in hot weather. Moreover, they are good swimmers and are known to cross several rivers in search of prey. The species is equipped with webbed toes, which is just another Sumatran Tigers' adaptation for life in the wild. Sumatran Tigers are distributed on the Indonesian island of Sumatra and are found in lowland forests, mountain forests, and tropical rainforests. Their color pattern helps them to hide in the dense bush and to stalk prey from the rear. Although the Sumatran Tiger may hunt everything that moves, wild pigs and various species of deer are the common prey of this predator. It is interesting to know that in about 90% of cases, a Sumatran Tiger fails to catch their prey. Nowadays, the population of the Tiger is greatly reduced due to agriculture development and poaching. It is believed that there are about 400 Sumatran Tigers left in the wild. They are also kept in zoos and reserves where breedings sometimes take place. The Gunung Leuser National Park has the largest population of Sumatran Tigers.Sumatra has undergone much agricultural growth and as a result, tiger habitat has become fragmented with about 400 tigers inhabiting five National Parks and two Game Reserves. The largest population of about 110 tigers lives in Gunung Leuser National Park. Another 100 live in unprotected areas that will soon be lost to agriculture. The tigers that live in unprotected areas are very vulnerable to poaching as well as the killing of problem animals that come in contact with villagers encroaching upon the animal's habitat. Sumatran Tigers are solitary animals and can be found together during a mating season or when a female raises her cubs. Males are strictly territorial and do not allow other males to settle on their territory. However, they do allow other males to periodically cross their home ranges. Females are not territorial and are rarely seen protecting their areas. The Sumatran Tiger can attack man, but it is not a human eater. Generally, the species is rarely seen in fights and prefers to avoid run-ins. The rate of mortality is rather high especially among the young. The species suffers greatly from habitat fragmentation and human predation. Sumatran Tigers are known to live for about 15 years in the wild and 25 years in captivity. Sumatran tigers are critically endangered. The Indonesian Sumatran Tiger Conservation Strategy has been established by the Indonesian Ministry of Forestry and it outlines management strategies for both wild and captive tiger populations.Even without any further losses of these magnificent animals,, the present populations are so small that they are vulnerable to severe environmental catastrophes, as well as genetic problems typical of small populations. Indonesia has 65 captive Sumatran tigers living in zoos, 100 in European zoos and 12 in Australian zoos. There are 55 tigers managed by North American zoos of which the Honolulu Zoo has two. Unfortunately, our pair cannot be bred for medical reasons. The entire captive population is descended from 37 wild-caught founders. It is now illegal to hunt tigers, however, this has not stopped the poaching of these animals for tiger products. China, by virtue of its large population, is the largest consumer and producer of manufactured products containing tiger parts.Outside tiger range countries, large numbers of bones ands other tiger products have been found in Taiwan and South Korea, many of which were from Indonesia. A great number of these medicinal tiger products are also consumed by Asian-Americans in North American cities, who can afford the expensive prices. The World Wildlife Fund has recently made progress working with the Schools of Chinese Medicine in North America to change attitudes toward the use tiger products.